The Apache web server is the most popular way of serving web content on the internet. Using virtual hosts, you can use one server to host multiple domains or sites off of a single interface or IP by using a matching mechanism. In easy words, you can host more than one web site on a single server. 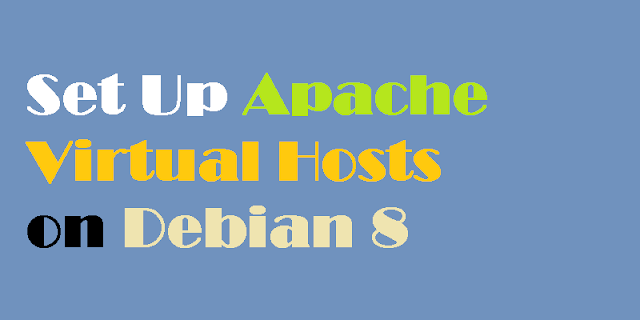 This article will guide you through the steps to set up two Apache virtual hosts on a Debian 8 server, serving different content to visitors based on the domain they visit. One Debian 8 Server with a non-root user with sudo privileges. We'll create virtual hosts for example.com and test.com, but you can substitute your own domains or values while following along. If you don't have domains available to test with, you can use example.com and test.com and follow Step 5 of this guide to configure your local hosts file to map those domains to your server's IP address. This will allow you to test your configuration from your local computer. Our document root, the top-level directory that Apache looks at to find content to serve, will be set to individual directories under the /var/www directory. We will create a directory for each of the virtual hosts we'll configure. Within each of these directories, we'll create a folder called public_html that will hold the web pages we want to serve. This gives us a little more flexibility in how we deploy more complex web applications in the future; the public_html folder will hold web content we want to serve, and the parent folder can hold scripts or application code to support web content. The $USER variable uses the value of the user you are currently logged in as when you press ENTER. By doing this, our regular user now owns the public_html subdirectories where we will be storing our content. Your web server should now have the permissions it needs to serve content, and your user should be able to create content within the necessary folders. Let's create an HTML file for each site. Let's create a simple index.html page for each site. This will help us ensure that our virtual hosts are configured properly later on. Save and close this file. You now have the pages necessary to test the virtual host configuration. Next, let's configure the virtual hosts. Virtual host files specify the actual configuration of our virtual hosts and dictate how the Apache web server will respond to various domain requests. Note: The default Apache configuration in Debian 8 requires that each virtual host file end in .conf. This virtual host matches any requests that are made on port 80, the default HTTP port. Let's make a few changes to this configuration, and add a few new directives. First, change the ServerAdmin directive to an email that the site administrator can receive emails through. Next, we need to add two new directives. The first, called ServerName, establishes the base domain for this virtual host definition. The second, called ServerAlias, defines further names that should match as if they were the base name. This is useful for matching additional hosts you defined, so both example.comand www.example.com both work, provided both of these hosts point to this server's IP address. Now that we have created our virtual host files, we can enable them. You've created the folders and the virtual host configuration files, but Apache won't use them until you activate them. You can use the a2ensite tool to enable each of your sites. The sites are now configured. Let's test them out. If you're using real domains configured to point to your server's IP address, you can skip the next step. But if your domains haven't propogated yet, or if you're just testing, read on to learn how to test this setup using your local computer. This will intercept any requests for the domains that you configured and point them to your Apache server, just as the DNS system would do if you were using registered domains. This will only work from your computer though, and is only useful for testing purposes. Make sure you follow these steps on your local computer, and not your Apache server. You will also need to know the local computer's administrative password or be a member of the administrative group. This will direct any requests for example.com and test.com on your computer and send them to your server at 111.111.111.111. Save and close the file. Now you can test out your setup. When you're confident things are working, remove the two lines from the file. Note:If you adjusted your home computer's hosts file as shown in above step, you may want to delete the lines you added now that you verified that your configuration works. This will prevent your hosts file from being filled with entries that are not actually necessary. You now have a single server handling two separate domain names. You can expand this process by following these steps to add additional virtual hosts. There is no software limit on the number of domain names Apache can handle, so feel free to make as many as your server is capable of handling. I have done according to steps you have mentioned but when i restart Apache services, it doesn't come up??? You must have made mistake in Apache conf file, pls post error code in comment so i can see what causes the issue. You were right...i have just corrected the mistake and its working now..thanks for your prompt response.